Super middleweight boxer John McCallum will have the backing of a raucous home crowd for the first time in almost four years when he lines up at Meadowbank on Friday, October 21. The 28-year-old, who is managed by London-based promoter Steve Goodwin, has announced his next fight will take place at the Capital venue on the undercard of Josh Taylor’s super lightweight Commonwealth title bout with Dave Ryan four weeks tomorrow - a match-up that will be broadcast live on Channel 5. McCallum, who has won nine of ten professional contests, last fought in Edinburgh in December 2012 – at Meadowbank – when he defeated Simone Lucas on points. 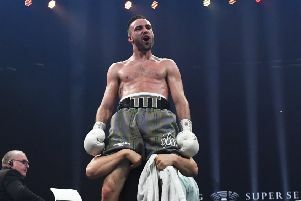 However, the former Leith Victoria amateur has regularly found himself boxing outwith his homeland having fought five of his last six opponents in England.